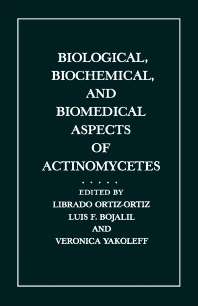 Biological, Biochemical, and Biomedical Aspects of Actinomycetes documents the proceedings of the V International Symposium on Actinomycetes Biology held in Oaxtepec, Morelos, Mexico, 16-19 August 1982. This volume contains 45 chapters and opens with a paper on the pathogenesis of Actinomyces israelii. Separate chapters follow on the incidence, etiology, diagnosis, and treatment of actinomycotic infections; the mechanisms by which A. viscosus can adhere to tooth surfaces; the host response to Actinomyces viscosus Ny1; the cell wall as determinant of pathogenicity in Nocardia; and medical and microbiological problems in human actinomycoses. Subsequent chapters deal with topics such as chemistry of the of the rodlet mosaic fiber portion of the Streptomyces coelicolor A3(2) sheath, but also the presence of chitin in S. bambergiensis (hairy spores); lipids of mycobacteria, nocardiae, and rhodococci; genetic determination of antibiotics coded by plasmids; the morphology and ultrastructure of Pilimelia; and the ecology of streptomycete phage in soil.